One of 100 "portrait mummies"
This astonishing small 3-foot mummy was originally found in 1911 by archaeologists in Hawara, Egypt and named the Garret Mummy. There's a detailed portrait covering the face and the linen wrappings were intricately woven in a geometric pattern of overlapping rhomboids that framed the portrait. It's an image of a little girl with a serene look on her face, dark hair tied back, wearing a dark red tunic and gold jewelry. Entombed besides her in the same underground chamber were four other mummies. 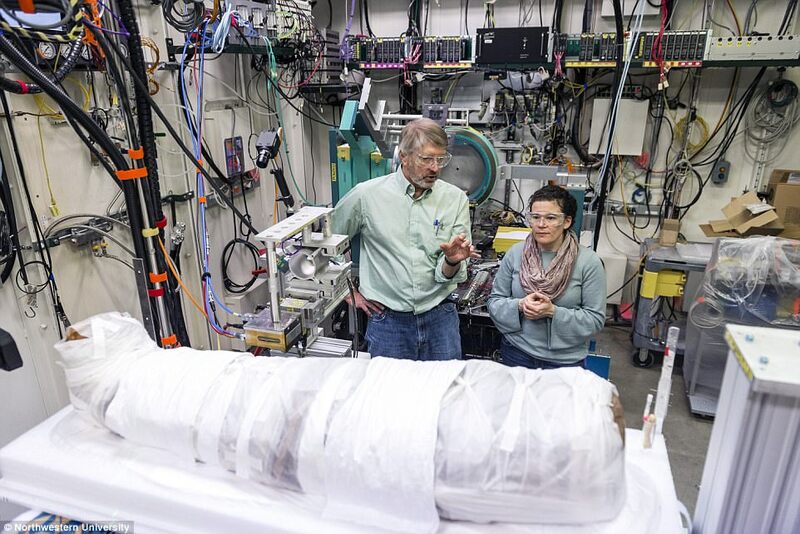 After 106 years of patiently waiting for some method to examine the mummy without damaging it, scientists from Northwestern University are using an innovative X-ray scanning technique to see through her mystery. These scans revealed how her body was prepared 1,900 years ago, what items she was buried with, and even what killed her. This is the first time x-ray scattering technique has been used on a human mummy as it uses extremely brilliant high-energy x-rays combined with CT scans to probe the materials and objects inside the mummy, while leaving the mummy and her wrappings intact. This recreated a 3D map of the mummy's entire structure allowing researchers to confirm she was a 5-year-old girl. "This is a unique experiment, a 3D puzzle. We have some preliminary findings about the various materials, but it will take days before we tighten down the precise answers to our questions. We have confirmed that the shards in the brain cavity are likely solidified pitch, not a crystalline material. We also are investigating a scarab-shaped object, her teeth, and what look like wires near the mummy's head and feet." Other than the Garrett mummy, there are about 100 other mummies with lifelike portraits placed over their faces. Researchers believe Romans influenced the Egyptians to create paintings for the deceased instead of sculptures. The Garrett Mummy's portrait looks different than the others, like using a unique style from another artisan or workshop. Analysis shows the painting was made with beeswax and pigments. These clues lead researchers to believe this mummified girl belonged to an upper-class household who had the wealth and culture to preserve their child in such a way. "Intact portrait mummies are exceedingly rare, and to have one here on campus was revelatory for the class and exhibition. This is a once-in-a-lifetime opportunity for our undergraduate students - and for me - to work at understanding the whole object that is this girl mummy. Today's powerful analytical tools allow us to nondestructively do the archaeology scientists couldn't do 100 years ago." The scans suggested the girl died of tuberculosis, smallpox, or malaria, says Dr. Taco Terpstra. Since there were no obvious signs of physical damage, it's more likely she died from a disease. With this Garrett Mummy study as an example of how technology can help archaeologists and historians extract more information from hard to investigate artifacts, especially such old and delicate ones wrapped beneath layers of culturally significant materials, there may be a new wave of data when scientists restudy such ancient items with new scanners. The mysterious void found in the Great Pyramid of Giza is one more example of this, and I can't wait until they try scanning those crystal skulls!